Just 14 months ago, Dennis Edwards made the move and struck out on his own as Dennis Edwards Flowers. 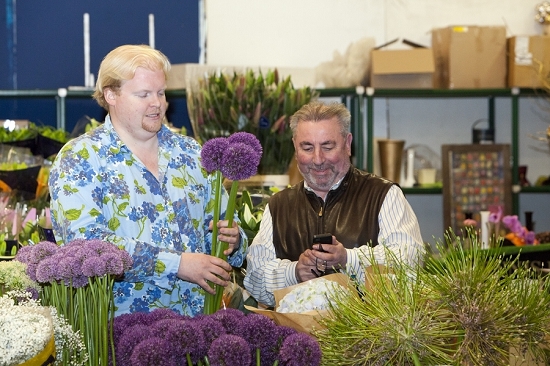 Today, he has built a great sales team, and his ever-growing list of devoted customers have voted for his company - Dennis Edwards Flowers - as Wholesaler of the Year 2013 in the inaugural Flower Market Awards. Not bad for 14 months' work! Of course, Dennis's success has not just been 14 months in the making. Instead, Dennis has a lifetime's experience supplying some of the country's most successful florists as a Flower Market wholesaler. "We've got a great team now," says Dennis. "Eddie [Edwin Martin] joined me and he had a big following too. I don't think I could have done this without him. Then his son, Sonny, has started with us and is doing really well, and young Charlie has joined us too, plus there's Jackie our Company Secretary. Good to have some young blood!" Trust is a huge factor in the flower industry. Florists trust Dennis and Eddie to deliver what they need, when they need it, and they never seem to let them down. This may explain why so many customers moved their sourcing to Dennis Edwards Flowers, and how the company keeps winning new business despite the tough economic conditions. "I suppose it was not a good time to start a business," says Dennis. "But we’ve put a lot of work in and it seems to be going well." It could also be down to the fact that in no small part to their positive attitude to the Flower Market life, thinks Dennis: "We love what we do. We all want to be here. We all enjoy coming to work, and I think that comes across." "We're not frightened to try anything new," says Dennis, whose stand draws you in to admire the rare and the unusual that he manages to find for his discerning customers. New festivities seem to be having an impact on the industry, and Dennis has noticed how important Halloween has become not just for the supermarkets but for florists too: "Halloween is a big week for flowers. Venues like to use an orange colour theme – orange amaryllis, peppers and so on – and cover them in spooky false cobwebs. At Halloween a nightclub cleared us out of anything orange for their Halloween party!" Thanksgiving seems to be gaining popularity amongst Londoners, whilst Christmas seems to start earlier every year with florists increasingly seeking out seasonal flowers and foliages from early November. When told his company had been shortlisted for Wholesaler of the Year 2013, Dennis – with typically Dennis humour - started lapsing into his acceptance speech: "I'd like to thank…!" adding "I hope it doesn't change me too much!" You can be assured that whatever the time of year, Dennis Edwards Flowers will have stock and a positive, friendly outlook to inspire you. For more on Dennis Edwards' life in flowers go here. Visit Dennis Edwards Flowers at www.dennisedwardsflowers.com or call 020 7498 5655.